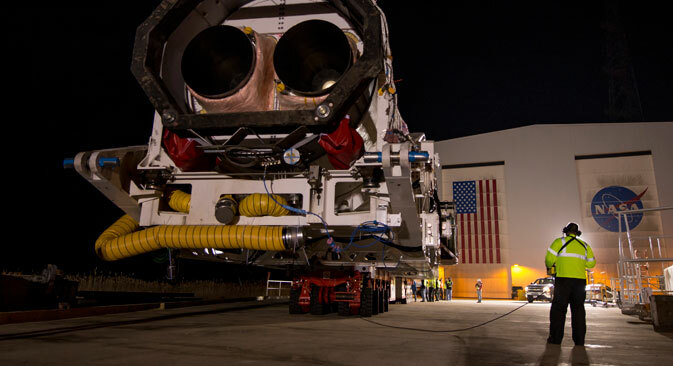 Russia delivers first two RD-181 rocket engines to U.S.
60 Russian engines ordered by a U.S firm cost about $1 billion. Russia has supplied the first two RD-181 rocket engines for the Antares rocket to the U.S. under the previously signed contract, the press center of the RSC Energia told the TASS news agency. “On July 15, the first two RD-181 engines were shipped from Russia and delivered to the USA on 16 July,” the corporation said. Before shipment to the United States the engines underwent technological and hot fire tests. Originally, it was planned that the engines would be delivered to the customer in June. In 2015, Russia plans to supply a total of four RD-181 to the U.S., with four more to be shipped in 2016. As previously reported, NPO Energomash (RSC Energia is the managing organization of the enterprise) is planning to supply 60 new RD-181 rocket engines to the Orbital Sciences Corporation in the U.S.
A firm contract for 20 engines was signed in January 2015. The agreement includes restrictions on the use of RD-181 units in military programs – rockets equipped with Russian engines should not be used for the launch of military spacecraft. The 60 Russian engines will cost the customer about $1 billion, which includes a whole range of services – flight training, rocket engine installation and testing. The first launch of the U.S.-made Antares rocket with Russian RD-181 engines is scheduled for March 1, 2016. Previously, these missiles were equipped with AJ-26 engines, based on the Soviet NK-33.